For an alarming majority of people, not eating a Hot Dog is just as bad as rejecting the meaning of life itself. Whether in the stadium or in the house, whether for pool parties in the peak of summers or any odd time as the heart desires, it is almost a rule to ensure the presence of these classic King of fast food as a staple. However, it would be wrong to deny the fact that Hot-Dogs in general are not exactly compatible with good health. Depending upon its size, it can load you up with very high calorie count, sometimes as much as 500 to 700 calories or more per serving (including bread and topping)! This can be a massive concern to those who are conscious about their weight and health yet cannot detach them from the love of this genius culinary creation. The good news is it is possible to opt for a low calorie hot dog if you are enlightened enough to make the right choices as far as the ingredients are concerned. If you heart has just skipped a beat thinking about the loss of juicy meat in the contents, be assured that it is nothing of the sort. You can actually bid farewell to a chunk of the calorie content and have your share of meat and treat intact. Topping it with the blessing of not having to compromise on the taste, makes these simple yet effective choices something that you should try out with immediate effect. • Substitute your refined flour bread with a wholegrain option. This will take of 50% of the calories that you earn from the bread. Shops today have ensured offering such options to one and all so locating them will not be an issue. If however, for some reason you don’t get wholegrain bread, try tearing away half of the bread while gorging on the rest. • Seek options of lean meat in your Hot-Dog. Richer the meat, richer is the taste and some providers don’t object to loading up their products with more than 10gms of saturated fat or more depending upon the size. However, there are many lean meat options with saturated fat content as low as 2gms available in the market. All you have to do is ask for these options and then read through the label to ascertain that you got what you asked for. At the same time, you must be in the lookout for organically raised animals that have not been treated with anything artificial be it antibiotics or hormones. • You could lose up to 80 calories if you free your Hot-Dog from calorie rich toppings like the friendly neighborhood ketchup, mustard and cheese sauce. Homemade sauces with no preservatives and less saturation in terms of sugar and salt can help massively. • Try a veggie Hot-Dog at times. These options are tasteful and contain around 40% less calories than the meat alternatives. Self control is the key to achieve an optimum and organized relationship between Hot-Dogs and you. 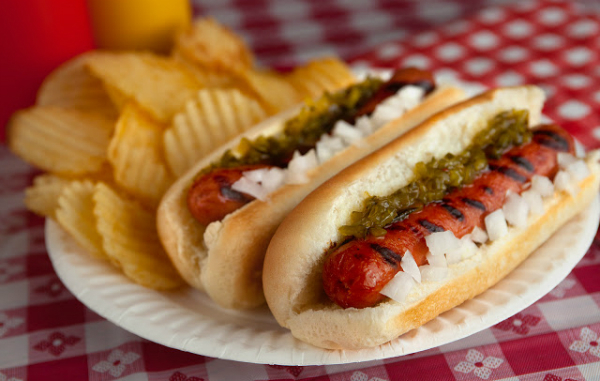 Anytime of the day, try not to allow the calorie count of one hot-dog to jump over 250 calories.